Editor’s Note: This is just the beginning, 1 Day of Art has unleashed a strange cocktail of awareness in our poor author, and he now walks around calling himself, “The Engineer Formerly Know As” and won’t respond to inquires about F=ma. The authorities have been alerted. It’s just over a week ago that I jumped on a SwissAir flight to Copenhagen and headed directly to Hotel Fox to participate in 1 Day of Art for (t)here magazine. The experience was simply amazing, an adventure in the truest sense of the word, and a time I’ll never forget. I had won this trip via a Creative Invite on Talenthouse.com, the social networking site for all manner of artists and creators. The plan was simple, to fly to Copenhagen to make some art for the magazine within the 24 hour time limit. 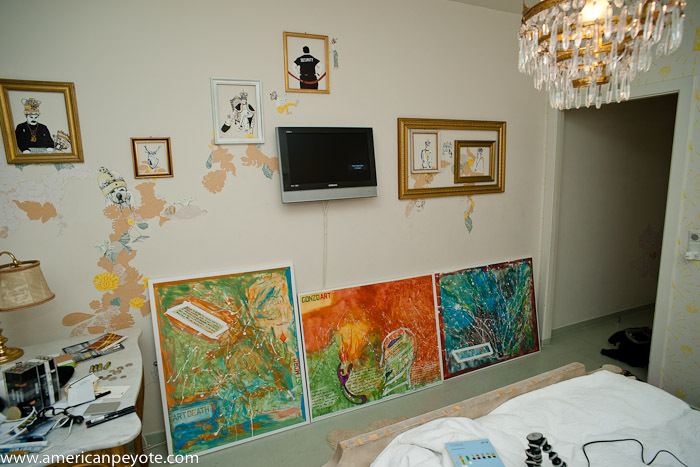 I stayed in the Diamonds room at Hotel Fox, an establishment where every room in a piece of art, the perfect place to create in. I arrived at the hotel around 4pm, and met up with the (t)here magazine crew around 8pm with the other artists to chose our topics for the 24 hour creation madness. I drew a card from a deck of famous Danish figures, and on the back it said, “Artist’s Choice.” This meant I was free to do whatever I felt was right (or wrong), and I decided to choose nothing, placing my full faith in the process, sure that something coherent and good would create itself. All that was needed was to be the enabler of the energy flow. I am not a religious man. 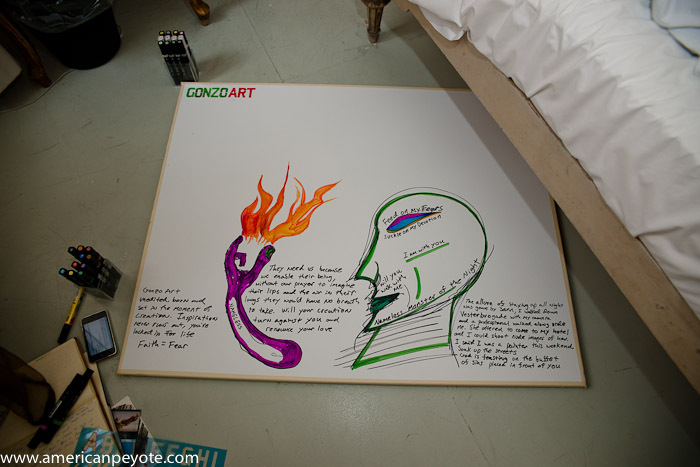 I like to think of myself as spiritual, and believe that art is pure energy. Those who know of physics and electricity or have an appreciation for the dangerous forces of Nature can appreciate this analogy; you do not create or destroy matter, and energy can not be dominated, only diverted in one way or another. That’s what painting is for me, my body directing the energy of creation. No God need enter into the equation, because no sane God would have anything to do with such foolishness, but that’s another topic. I got my assignment at 8pm on Friday night, and had till 8pm Saturday to deliver. I stayed out most of Friday night, soaking up Copenhagen and avoiding prostitutes on the street. I crawled out of bed around 10 am and had an amazing breakfast in the hotel lobby. Jason, one of the (t)here magazine crew asked me if I’d started working and I said I was heading out to find some canvases. The night before I’d been given some directions to a store to buy supplies at, and around 11 am I began the hunt. 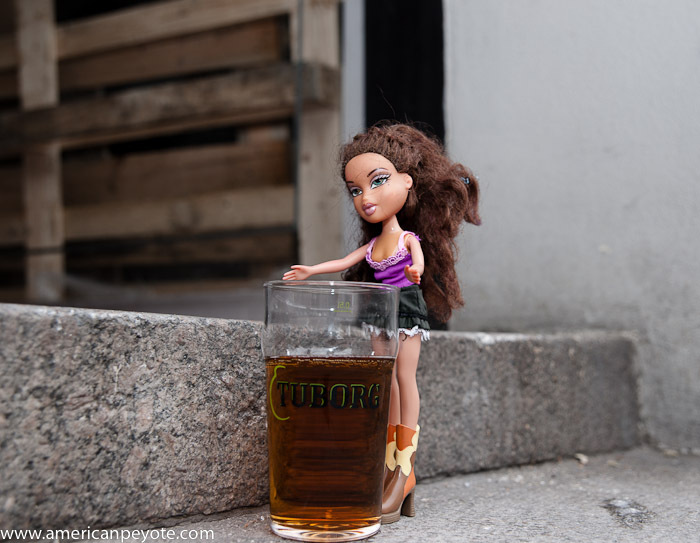 As I was out I pulled out one of my Bratz dolls (the backup plan) and posed it next to a glass of beer waiting on the street, it seemed like the right thing to do. I got back to the hotel around 12:30 with three of the most expensive canvases I’ve ever bought. Fine linen things stretched over solid wood frames, perfect for propping up in the hotel bathroom for a proper splatter fest. I had brought a rolling MountainSmith bag filled with creation implements with me to the hotel. Among the mayhem, a set of Manga markers – a Christmas gift from my ex-girlfriend. I’d never really used them before, but knew they’d be essential for the trip. I then removed my T-shirt, assembled paints, and began the process. For the next 4-5 hours I filled each white canvas with color and shapes. I wrote with paint pens, colored with Manga markers, and added layers of latex on top because it felt right and good to do. By 6pm they were done, and I’d documented the whole process with my A900 DSLR. I’m not a dramatic person, and dislike it when people use over-used taglines like, “once in a lifetime” and “life changing” or “turning point.” However, 1 Day of Art Copenhagen feels like a once in a lifetime life changing turning point for me. It was the first time I’d really just sort of let go and executed an art project. For sure, there were many points leading up to this day, but it’s the apex, which we remember and remark upon. So happy for you and that it was such a great experience, please share more with us. Congratulations!